The first race of the weekend, Ironman Vineman, is an older event, but new to the Ironman brand. 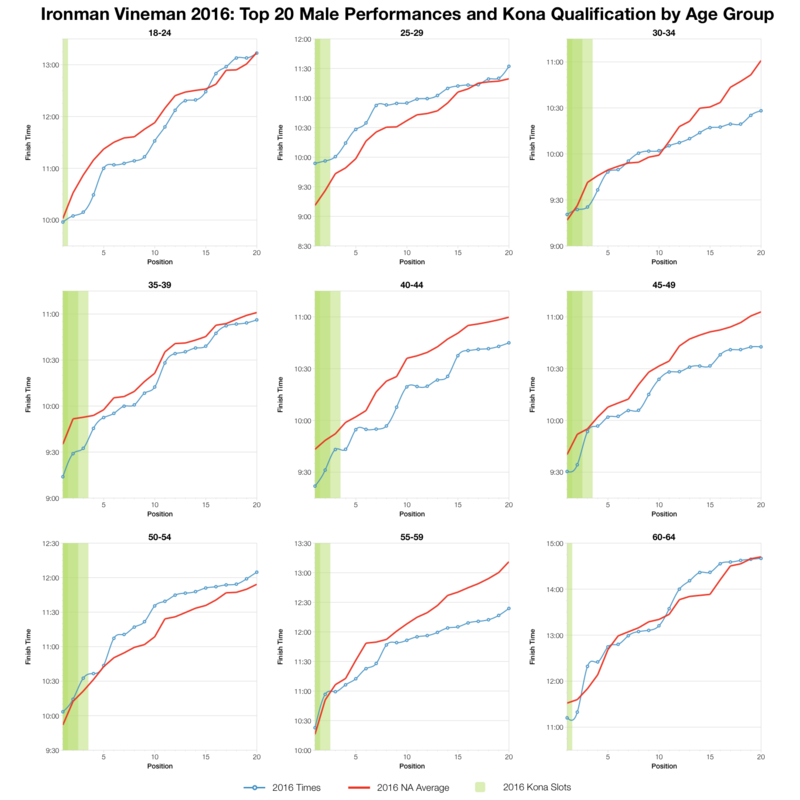 It’s a medium to large sized race with the standard 40 Kona slots on offer to age groupers. 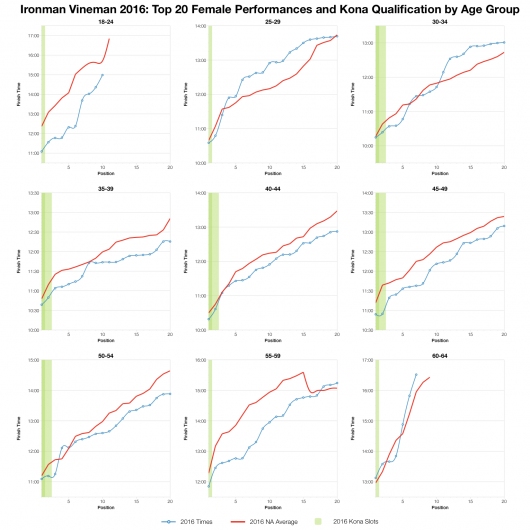 Although there is a history to the Vineman, as with most new Ironman brand events, I don’t have previous results to hand for this analysis. 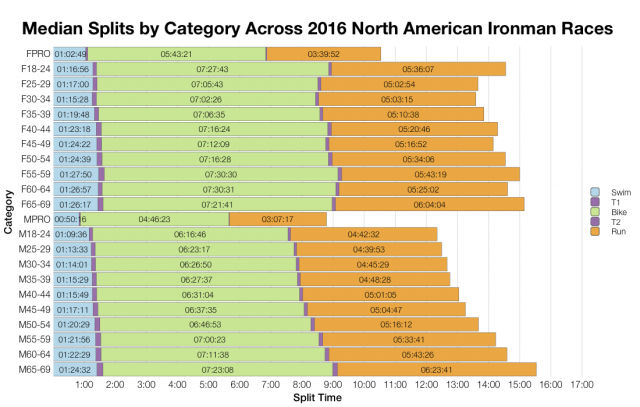 To give some context I’ve used data from other 2016 North American Ironman races for comparison. Alongside the distribution for Vineman I’ve included a chart for Canada and Lake Placid (Texas is excluded due to a shortened course); a small set, but one that should give a feel for typical Ironman distributions. 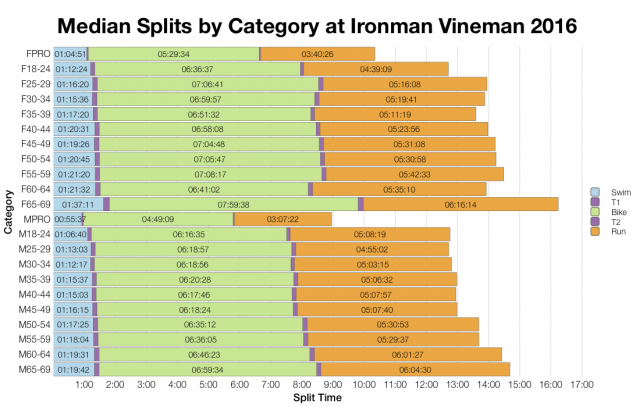 In comparison to these other race results, Ironman Vineman shows faster bike splits and slightly slower run splits resulting in broadly comparable overall splits. Vineman appears slightly faster at the overall median, but doesn’t show much difference in the top 5%. Competitor numbers place Vineman somewhere in the middle of the group. DNF and DNS numbers also fall somewhere in the middle. This seems to come from a relatively high DNF/DNS rate in swim numbers; I expect this reflects larger DNS numbers at this race rather than a high level of DNF. The high numbers for Texas can likely be attributed to the course alterations and severe weather conditions of that day. The comparison of age group medians yields similar results to the distributions: faster bike times and slower run times. There’s more variation when comparing the combined medians and although Vineman is probably a little faster, it’s not consistent. Again Texas is excluded from the North American chart. As we’d expect from a US race the majority of athletes come from the US or neighbouring territories. Based on the start list I’ve calculated the slot allocation for Vineman (actual numbers will depend on final start numbers) and from that the automatic qualifying times for each age group. Although I don’t have older Vineman data, you can compare these times with other races on my Kona Qualification page. For context the charts above include a red average line drawn from Ironman Lake Placid and Canada data. For many age groups the Vineman times aren’t too far from those averages. In a few cases Vineman was faster than the other races. There is one exception, M25-29 was much slower than at the other two races, but some variation in age group performance is to be expected. It’s hard to give a useful analysis of a race when you don’t have past results to work with. Comparison with results from other races can give some context, but we should be careful not to draw too many conclusions. It seems fair to say that age group results from Ironman Vineman are broadly similar to those of the other North American races this year. 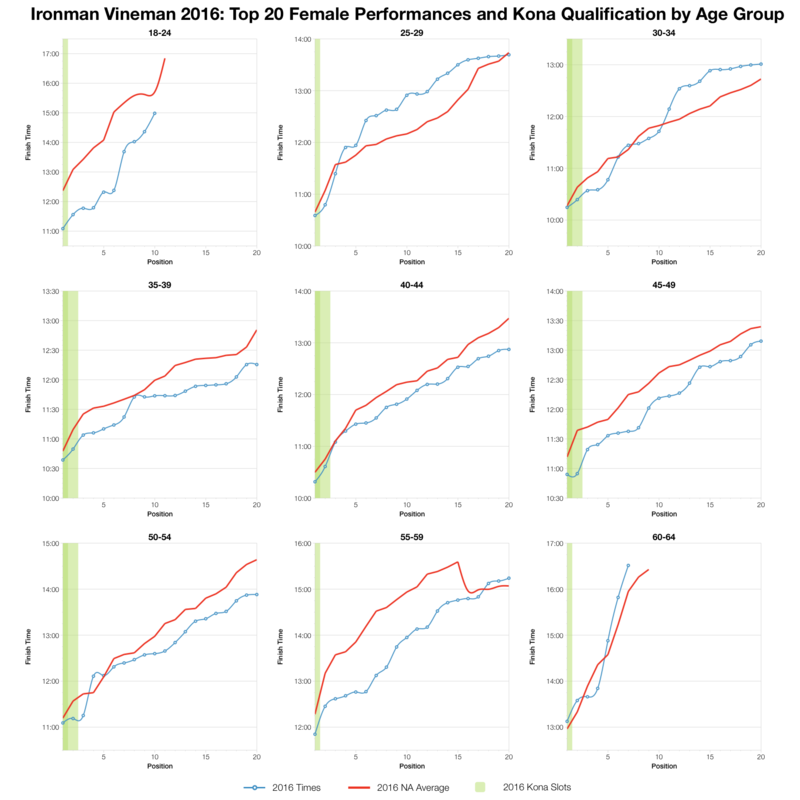 You can access a spreadsheet of the full results and splits from Ironman Vineman 2016 on my Google Drive.